The 369th Infantry Regiment served admirably in World War I, despite the racism they faced. Black History Month provides a great opportunity to remember and honor a special group of African Americans that made a huge impact during the battlefields of World War I. They were called The Men of Bronze, The Black Rattlers, but we call them The Harlem Hellfighters. 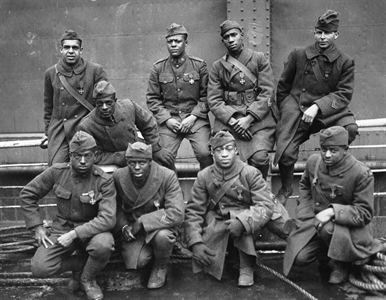 The Harlem Hellfighters made up the 369th infantry regiment during World War I, and they were the first all black regiment during the war to serve under the American Expeditionary Forces. Before the 369th, African Americans had to enlist in the French or Canadian armies. At this time in United States, racism was at one of its highest points since the Civil War, and many African Americans thought that joining the army would earn them the respect of their white counter parts. But this came to no avail, as African Americans were not allowed in white regiments, but instead had to fight in their own regiments, like the 369th. When 369th made it over to Europe, racial prejudices followed them as white American soldiers refused to share a trench with the African American soldiers. Instead, the 369th fought along side the French who embraced the 369th with open arms and treated them as equals. But even French Colonel J.L.A Linard wrote a notorious pamphlet called, “Secret Information Concerning Black American Troops,” which warned French civilians of the alleged inferior nature and supposed racist tendencies of African Americans. Even with the racial backlash and unfair treatment, the 369th went on to be one of the greatest American regiment in World War I. They served bravely at the second battle of the Marne which pushed the Germans out of the outskirts of Paris. They then went on to serve in the American counterattack, also called the Meuse-Argonne offensive. The 369th suffered severe losses but were able to capture the important village of Sechault. At one point, the 369th advanced faster than French troops on their right and left flanks and risked being cut off. By the time they reorganized, they had advanced 8.7 miles through severe German resistance. At the end of the war, the 369th had advanced all the way up to the Rhine river, being the first Allied unit to do so. On December 12th, the 369th was relieved and went home. By the end of the war, the 369th had spent 191 days in the front line trenches, more than any other American unit. The group also suffered the most losses of any American regiment with 1,500 casualties. When they returned home, two Medal Of Honors and numerous Distinguished Service Crosses were awarded to members of the regiment. Stories of bravery spread, including those of Henry Johnson and Needham Roberts both of whom fought off a 24-man German patrol, though both were severely wounded. Johnson went on to be awarded the Croix de Guerre, a French military award. He was the first American to receive this honor. Despite all of this recognition and these acts of great valor, most of the returning members of the 369th still had to face severe racism and were still treated as unequal to their white counter parts. While the 369th went on to see some action in the World War II, they had more of a behind the scenes role and did not see much action. The group finally disbanded in the 1946. The 369th is one of the greatest American regiments to ever serve our country. The valor and heroic acts of courage that these African American fighters displayed on the battlefield should not be forgotten, nor should the hate they suffered for simply having a different color skin. This article is written with great thanks and dedication to the selfless Harlem Hellfighters for their acts of valor. “Don’t Tread on Me, As God as my Witness, Lets Go.” – The Harlem Hellfighters.